The key to dealing with ADHD is self awareness – get to know you and your ADHD symptoms. ADHD is a condition that, if you’re wondering what to do about it, you’ll have plenty of time of think about it and get to know yourself. It can be quite confronting. I was lucky that I started to develop a level of self awareness at a relatively young age. I was aware that I didn’t concentrate at school like everyone else, and that I got into trouble more than anyone else, and aware I was very different. My conscious awareness of my difference made me feel weird, but this ‘feeling weird’ triggered me to develop a level of self awareness that was fundamental to my growth. So then I started to think, how can I use this to my advantage? 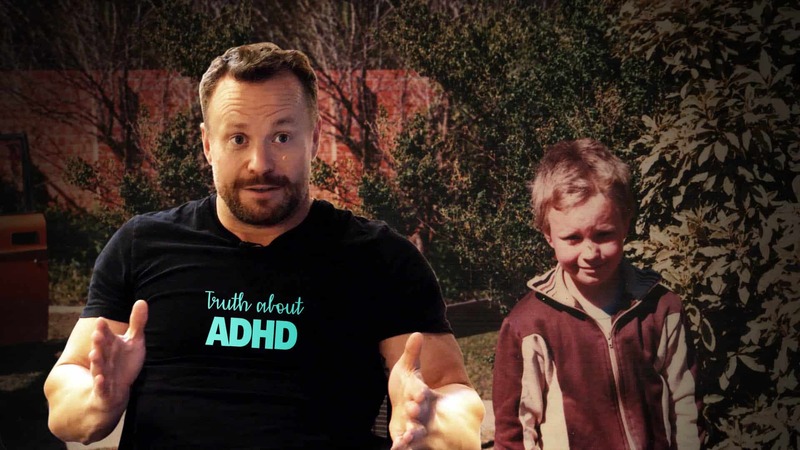 (Although It wasn’t until my early 20’s that I started to realise the benefits of ADHD). As a consequence of that suggestion, I failed every subject from year one to year twelve. I’d read a book, and it was like I was reading numbers moving on a page. I didn’t know until I left school that I had the capacity to learn, because everything up until that point I wasn’t f***ing interested in. The was I was classified or measured for intelligence at school was the ability to recite and remember things you were taught, and I was f***ing terrible at that stuff. All of a sudden at the age of 23 years-old I picked up a book, ‘The Magic of Thinking Big’ by David J Schwartz, and I read something that I was interested in. So, then I’ve gone, okay, if I’m not stupid, what else is a lie? And then, I started looking at all the lies I told myself and started dissecting them. And it was a long, long journey. A really long journey. But for me, ADHD was one of the greatest gifts I could’ve been given. The more we understand ADHD the more we understand self, and then the easier it is to work with it and not against it. When you work against a condition like ADHD it becomes a problem. And it’s not a problem, it is just a reason why things happen in a different way than things happen to others. It makes a big difference to confidence and self esteem when you understand that you just do things differently. You’re not perfect unless you’ve got both sides. If you’ve only got one side, you’re unbalanced. Flaws create perfection. There is no such thing as perfection where there’s nothing wrong. It’s being able to see the balance in having both sides, and the perfection of that. Loved this post! My sons school has recently informed me that he is showing signs of ADHD. From the moment he came into this world I knew he was special, this just confirmed it. It also opened my eyes that based on the symptoms not only would all my 5 kids measure on the spectrum but so would I and I get that everyone probably falls on the spectrum at some level. My challenge is this. How do I help him become more self aware now, at the age of 6, so that he’s more able to regulate his own emotions AND help him to find a better way to voice his needs without tossing chairs across the classroom? I’m not asking for a medical point of view as such, I’m asking from the prospective of someone who’s already lived through it. What do you feel could have helped you more to in the earlier years?